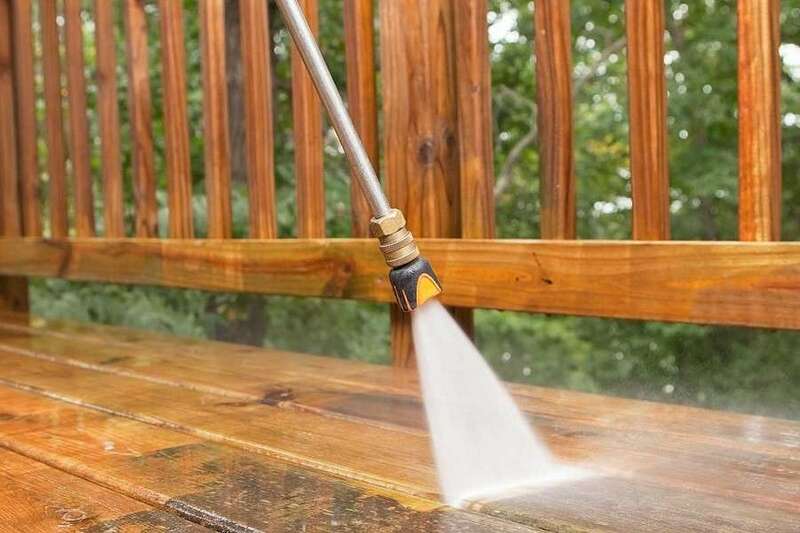 The right pressure washer can make cleaning your driveway, patio, outdoor fixtures, and your car incredibly easy. Investing in a quality pressure washer can prove the difference between backbreaking labor and a straightforward washing job. You don’t want to develop lower back pain while washing your garage, do you? A gas-powered pressure washer can prove the ideal choice for your home, particularly if you have a large exterior area. Without a pressure washer, keeping the exterior of your home looking good as new can be next to impossible. The Generac 7019 is among the leading gas powered pressure washers on the market. The washer has been designed to be user-friendly, ensuring you don’t have a hard time using it, regardless of the purpose for which you use it. From cleaning your patio to washing your truck, you can use this handy pressure washer for a variety of applications, ranging from mild to heavy-duty. Range of Options - You can purchase this pressure washer in a number of options. Starting from 2500 PSI and going up to 3100 PSI, the water flow this washer offers is among the best on the market. You can also go for the 2800 PSI model. Prices vary based on the PSI level you select. You can also purchase the 3100 PSI model with a PowerDial. This gives you the flexibility of choosing the model that you feel will best suit your needs. Ergonomic Design - Unlike other brands in the market, Generac pays special attention to ergonomics. This is why this product is designed to be easy to move around and operate, placing less strain on your body. Plus, the handle is cushioned, enabling you to pull the trigger without having to exert much effort from your wrist. The PowerDial, should you opt for it, will allow you to adjust the setting to suit your needs. High Pump - The pump is at the same height as the engine of the pressure washer. 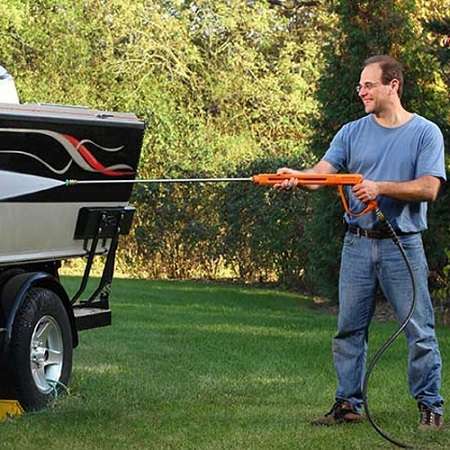 This means you can easily connect the hose without having to bend down. Again, this is attributable to the brand’s focus on ergonomics. Never-Flat Wheels - The product features 10-inch never-flat wheels that enable you to maneuver the washer around without any strain. You can conveniently place it wherever you need to use it. 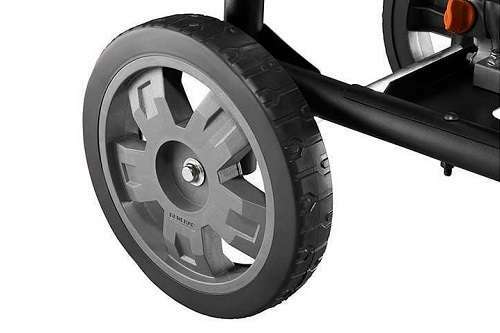 The wheels are sturdy and move equally well over all kinds of surfaces. Simple Controls - This handy gas-powered pressure washer features controls located close together. You will find the choke, on/off switch, and even the fuel shutoff button in the same place. 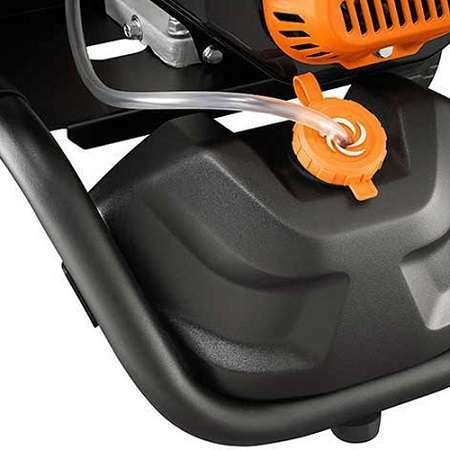 Multiple Nozzle Tips - There are multiple nozzle tips that come with this pressure washer. One of the nozzle tips is designed for use with soap, when you want to use soap with water. The other three allow you to change the angle at which the water flows, enabling you to adjust the flow as per your requirements. The Generac 7019 is among the highest rated gas powered pressure washers on Amazon with an average rating of 4.4 stars out of 5. Well over 80% of the reviews are positive, indicating that a vast majority of the people who purchased this pressure washer were satisfied with its performance and durability. A customer stated that the unit is easy to put together and installation of the hose and nozzles is simple as well. You only have to spend a few minutes on it. However, the customer did state that the washer already had oil inside when it was delivered. A customer was highly pleased with the design of the washer and the ability to use multiple nozzles. He wrote that it makes cleaning any surface simple and convenient, as all you have to do is change the nozzles and you are good to go. He also wrote that if you are tall enough, you won’t have to purchase the extension wand. A customer praised the versatility of the product, stating that it is flexible enough to be used for practically any cleaning job around the house. Since it is easy to move around, using it for different applications is not a hassle. On the flipside, a customer complained about the durability of the pull cord. According to the customer, the cord can come apart if pressure is exerted on it, which can prove risky. Handle it with care and there should be no issues. You can purchase the Generac 7019 on Amazon starting from under $255, which is the price of the basic 2500 PSI model, with no frills. 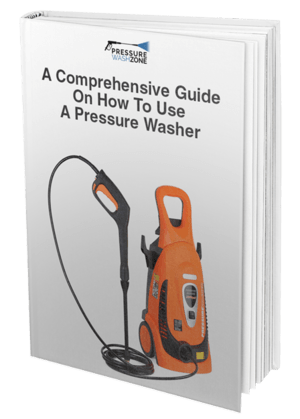 If you purchase the 2500 PSI washer with a surface cleaner, it will cost you under $325. The 2800 PSI model is priced at just under $270 and the 3100 PSI model at under $360. The 3100 PSI model with the PowerDial will cost you just under $430 and around $500 if you purchase the surface cleaner with it. 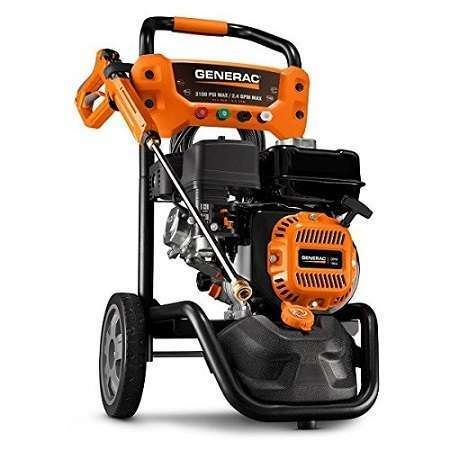 You can also check Generac’s website to search for locations from where you can buy this pressure washer. Do make sure you check for deals and discounts before purchasing this pressure washer so you can save some money on your purchase. All things considered, the Generac 7019 is among the best gas powered pressure washers available on the market today. Its high rating combined with its reasonable price makes it an option you should surely consider if you are planning to invest in a gas powered pressure washer.